Trying to find the perfect recipe for Tonight’s Dinner At Home just got easy – think eggs! Lots of textures going on in this crunch French Fry, Onion and Egg Bake Recipe. THE DISH comes alive with a fried egg on top. French Fries, Onion Rings layered in kimchi, cheese and sauce, and chopped bacon. Three Layers and baked until the cheese is melted. Plated and topped with a runny fried egg………….YUM YUM YUM! Homemade French Fries tossed them in corn starch ( gives a nice outer shell to the fry) and fried them the first time, Between batches letting them cool. I used my oven air fryer to cook up the potato wedges and red onion slices omitting the corn starch. The grated very very sharp white cheddar cheese melted on top of the dish is super gooey and yum! Prepare Potatoes and Red Onion - sit aside until time to fry. Toss the potato wedges in corn starch just before frying. You may want to fry the potatoes twice to ensure they are extra crunchy. 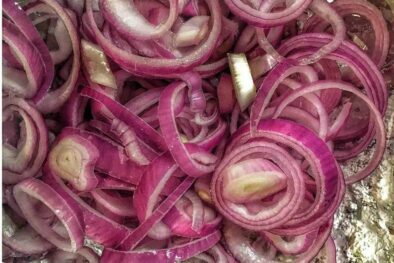 Slice red onions into circles dusting with corn starch before frying. Chop up about 1/2 cup of prepared Kimchi. You can make your own or use a store bought. Fry up the bacon. 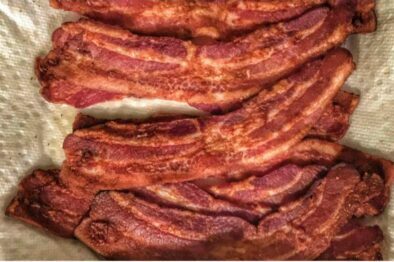 I like cheating and using Costco precooked bacon so all I have to do is warm it up. Mix the gochujang, sugar, dried chilis and ginger in a bowl until some what creamy. Add the potatoes,onion and Kimchi mix to the bowl gently stir. Add mix to an oven safe medium casserole dish. Add grated sharp cheese on top so it melts as it bakes. Bake in oven for 15 minutes at 350*F or until the cheese is super melted. Fry up an egg and serve on 1 cup scoop of the french fry, onion bake. 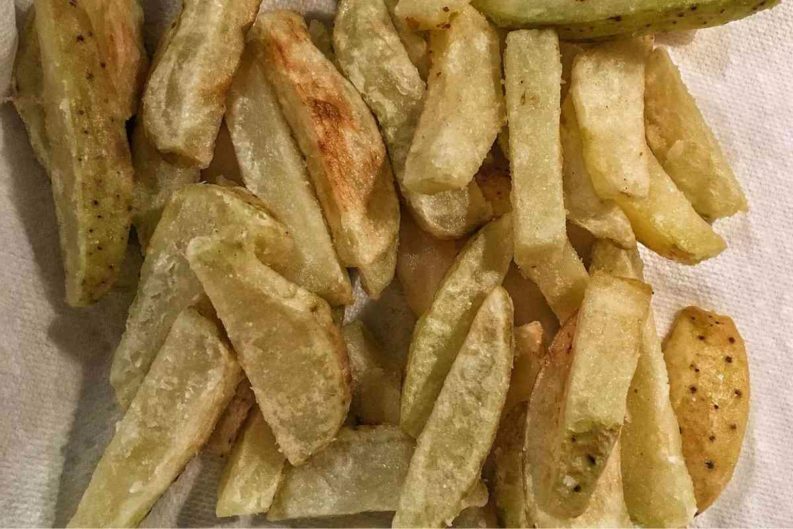 You can use an oven air fryer to cook potatoes and onions just use a spray oil on the vegetables omitting the corn starch. This recipe was inspired by Facebook user Vincent Bradberry. Images are by Vincent on this post. Be Creative with this meal.. if you don’t like it spicy leave out the gochujang and peppers. Be sure to comment on my post to let me know what you come up with! Kimchi, a staple in Korean cuisine, is a famous traditional side dish made from salted and fermented vegetables, most commonly napa cabbage and Korean radishes, with a variety of seasonings including fish sauce. I hope to make a batch of my own later this Spring so subscribe to my site for updates. Gochujang or red chili paste is a savory, sweet, and spicy fermented condiment made from chili powder, glutinous rice, meju powder, yeotgireum, and salt. I bought my first jar at Aldi in Autumn 2018. There are recipes online to make your own but since I could easily find it at the store I am cheating! Below are some of the highlights from this meal. I think you might love the following recipe if this one looks interesting! Eggplant and Herb Roll Meal – I can’t wait to grow more eggplant in my home garden just for this recipe. I’d love to hear how you like to add eggs to your meals. Be sure to comment on the post below or leave me a comment on my contact page.